Dubai: Dubai International returned to full capacity on Saturday for the first time in more than 72 hours after an Emirates plane caught fire and caused hundreds of flight cancellations and delays at the Middle East’s busiest airport. “Dubai Airports confirms that is has lifted all remaining capacity restrictions at DXB (Dubai International) and the airport is back to normal operations,” the operator said in a statement on Saturday afternoon. The Middle East’s busiest airport had operated with restricted capacity since 12:45pm on Wednesday after an Emirates Boeing 777 caught fire on the runway shortly after landing. The airport was then closed for several hours that day and then operated with only one of its two runways for 29 hours until Thursday evening. “The ability to prioritise large aircraft has enabled a return to regular scheduled activity sooner than anticipated,” Dubai Airports said in the statement. Over 500 flights were cancelled and hundreds of flights were delayed due to the incident, affecting thousands of passengers. At least 19,000 passengers were affected on Wednesday, according to Dubai Airports, and over 23,000 Emirates passengers were affected by Thursday midday, the airline said then. At least 21 airlines cancelled 109 flights on Saturday to and from cities in China, India, Pakistan, Saudi Arabia and elsewhere on Saturday, according to the Dubai Airports website. Those flight disruptions mainly impacted foreign carriers operating out of Terminal 1. Flydubai, the airport’s second biggest operator after Emirates, cancelled flights to Arbil and Basra. Emirates told Gulf News the previous day it would return to scheduled operations on Friday night. Indian budget carrier IndiGo said in statement it would operate 14 flights to and from Dubai on Saturday and resume scheduled services on Sunday. Jet Airways, another Indian airline, said it had shifted some of its flights to neighbouring Sharjah International during the restrictions and would resume its normal schedule on Sunday. 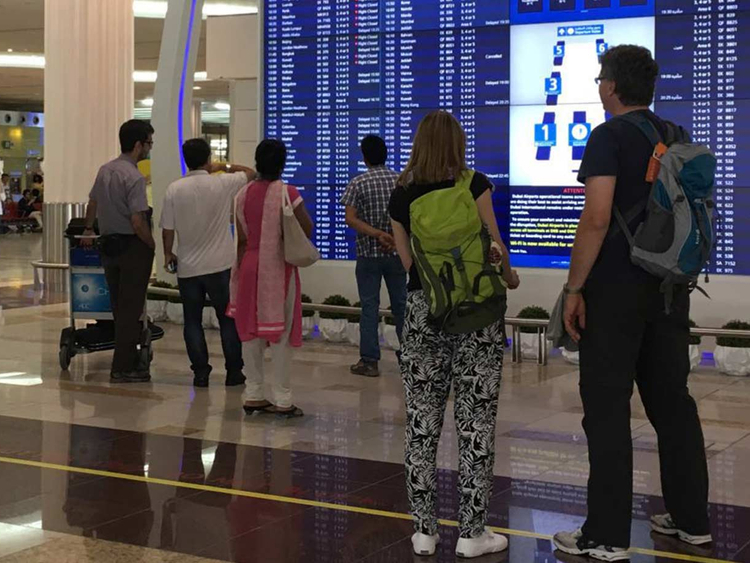 Passengers described scenes at the airport on Thursday, the day after the incident, as “chaotic,” telling Gulf News they had to transfer to Abu Dhabi International to catch their flights. An investigation led by the United Arab Emirates’ federal aviation authority, GCAA, is underway to determine what caused the Emirates jet with 300 people onboard to catch fire. All 300 escaped the aircraft before it was destroyed by the fire on the edge of the airport’s second runway. There were 13 injuries and one death, a firefighter tackling the blaze. On Thursday, Dubai Airports chief executive Paul Griffiths told reporters the investigators had recovered the aircraft’s cockpit voice recorder and flight data recorder. Emirates chairman and chief executive Shaikh Ahmad Bin Saeed Al Maktoum said Wednesday the Emirati and Australian pilots may have attempted to abort the landing due to wind shear, which is a sudden change in direction. Data released from flight tracking website flightradar24 appears to support this theory.